There is something about a row of trees that is beautiful. Possibly the structure of the row of trees vs. the organic shape of the trees. What ever it is this striated sky depicts a row of trees along a dusty path at Babylonstoren. The piece is modified depicting the dusty path as a canal coloured “water way”. This piece reminds me of how as humans we have the ability to create structured environments that are functional and beautiful. I feel that this garden is what all South Africans should be allowed to experience in their own backyards. This is opposed to the current trend of cramming people into developments and housing projects that reduce garden space in order to maximise profits and living space but remove peoples ability to have a green garden space. 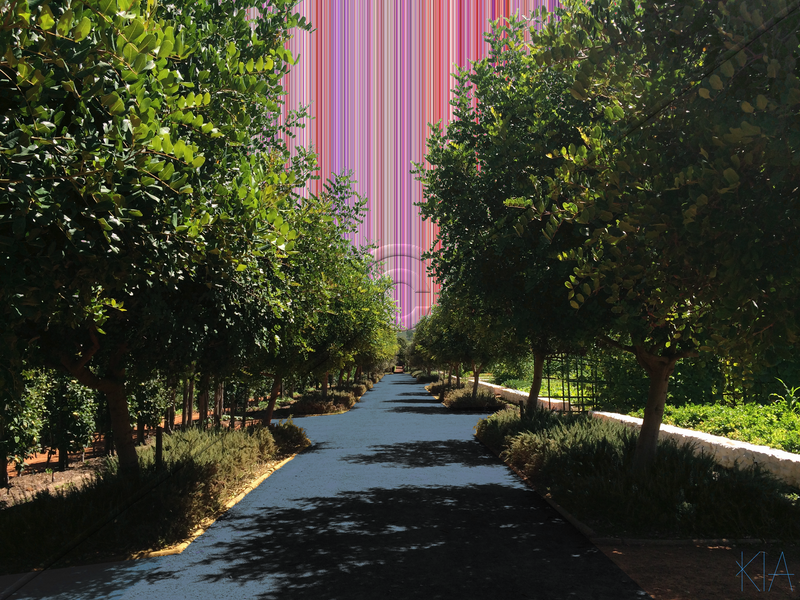 The beautiful and enchanting gardens of Babylonsoren are a gem to visit and this is the second striated skies piece that is based at the venue. I would most definitely recommend a visit.